Lock Philip Rivers in for another big week against the Raiders. Marshawn Lynch is also a great value in that game and will be a steal at only $6500. 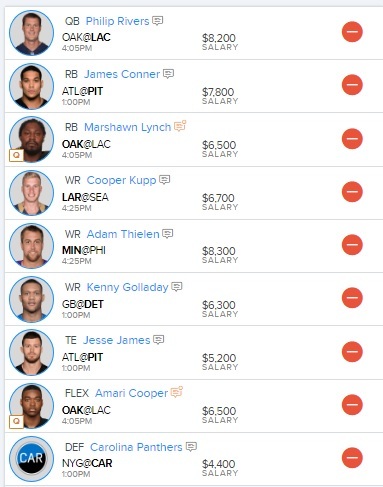 Adam Thielen has a great match up and its worth spending $8300 on him. Kenny Golladay is another solid value and may see a increase in targets. The round out the lineup I like the Panthers defense at home against the Giants.